Based on reviews from 36,261 users. Learn how our rankings work or see our guide to black Puma sneakers. Updated Apr 2019. When it comes to Puma sneakers, one vital factor that many take into consideration when getting a pair will always be color. Without a shadow of a doubt, color ranks high in being a deciding factor and the color of a sneaker? Well, it can make or break a deal. With that, there are always two types of colorways that a sneakerhead can choose from and these are the vividly intense colors that certainly stand out or the more subtle ones that can hold its own pretty well but blend in the background, too. The two choices, or categories if we’re to be specific, embody their own personality and can be defined however the wearer wants to. But if one were to really want a pair of Puma shoes in a color that will last a lifetime, a glow that can be subtle yet just as striking when the situation calls for it, it’s best to go with the tonal shade of black. But before we delve deeper into the beauty that is black Puma sneakers, it’s best to get a little background on the brand itself. So why get black Puma shoes? Black Puma shoes can be worn all year round. It goes well with most garments. It’s a fashionable choice and color. Dirt and scuff marks are less noticeable on black Puma shoes that other colored kicks. It’s easy to dress down or dress up with. Puma has a slew of choices when it comes to black sneakers, and we believe that one can never have too many black Puma shoes. For those who want more color, the brand mixes it up with other colors like Puma red and black shoes, as well as black and yellow Puma shoes. With a rich history, it’s pretty understandable why Puma is so popular. Whatever colorway presented, it seems to enjoy the limelight. But one color has been taking center stage for quite a while now and we all know that the color we’re talking about is the color black. Popularity is at its finest with black, especially for black Puma shoes. Puma Fierce Strap Swan - With a fashionable silhouette, this mid top sneaker combines performance tech and a great design very well together. It’s unique, and with the beautiful tonal black color, the sneaker is definitely elevated to a whole new level perfect to be a part of the women's black Puma collection of shoes. Puma Fierce Swan - Coming either black or white colorway, the Fierce Swan is considered an integral part of the black Puma sneakers collection. The high collar and tongue give it a nice design touch. It is heavily inspired by Rihanna and comes in as a collaboration between the New York City Ballet and Puma. Puma Fierce Core - The eye-catching Core version of the Fierce is uniquely sleek. The design seamlessly fits as one and is genuinely ingenious, giving it that enchanting look. It has a classy Jumping Cat logo that can be seen on the lateral side and is indeed a powerhouse sneaker in black. Puma Ignite Limitless - A four-way stretch Ariaprene fabric makes up the upper offering good airflow, the Puma Ignite Limitless is outfitted with some excellent sneaker technology. The "clam-shell" profile of the Ignite Limitless and was sported by famous “Starboy” singer Weeknd. It has many colorways available but is one of the favorite black Puma shoes out there. Puma Basket Platform Core - Joining the ranks of great black Puma sneakers, the Basket Platform Core takes inspiration from the 80s and 90s hip-hop community. Considered a darling at Puma, it’s part of the black and white sneakers collection that ups the swag game with the platform soles that it has. Puma Basket Platform Patent - Its overall design is one that truly wows. It’s classy, and many have praised the colorways available, especially the black ones. The women’s only Basket Platform Patent is perfect for dressing up. It is part of the platform collection of black Puma shoes made for women. Puma Basket Heart Patent - With an original shape and design fashioned from the Basket, this one from Puma features a black patent leather for the sneakers. From afar, the oversized satin laces are hard to miss as it adds a contrast to the smooth black upper. Overall, it’s a stylish shoe that is a part of Rihanna and Puma’s roster of fabulous shoes that are black. Puma Basket Platform Metallic - Style, comfort, a sneaker with substance, the Metallic design of the Basket Platform has it all. With a strong patent leather upper, it’s a great casual pair of shoes to wear out and about. Meanwhile, for many and Puma itself, the black and gold shoes are a treat to have and own. Puma Vikky Platform - With this pair of black Puma shoes, comfort is significantly boosted thanks to the SoftFoam sockliner, and the plush tongue and collar. For the cool sneakerhead, these Puma shoes are a treat with the suede upper treated in a nice black colorway. Puma Suede Platform - This is a great, albeit, affordable alternative to the Fenty Creepers. The luxurious upper is made of soft suede while the platform sole gives a charming appeal. Getting this in black just makes it all the better as it really does go with many different outfits. Puma Match Lo B&W - Part of the black Puma sneakers collection, the retro Match Lo B&W has a look that’s been upped with the addition of patent leather details that accentuates its silhouette rather nicely. Puma Match Animal - This black Puma shoe is well known for the fresh and exotic design it has to the upper. It came out in the early months of 2017, the black snakeskin leather upper giving the classic black tennis shoe a new persona and a bit of life. Puma Suede Bow - A face-lifted version of the original black Puma shoes iteration, the Suede Bow gets its name from the overtly oversize bow made of satin that can be found on the heel of the sneaker. It is an eye catcher and being done in black, a sure win with any fashionista’s outfit. Puma Roma - Another integral part of the black Puma sneakers collection, the Puma Roma was initially released in 1968 and brought back to life in the 2000s. It features upgrades such as a leather upper and comes in colors that are much more modern, such as the black that fits onto the shoe quite nicely. Puma Clyde Frosted - Black Puma shoes have been causing all the riot lately, and the Clyde Frosted joins in on the fray. It has the most elegant nubuck leather for upper, leather liners accenting it off nicely. The cotton laces are woven, and it’s just a real pleasure to own a pair of these. Puma Vikky Mid SoftFoam - Following suit with the original iteration, the Vikky Mid SoftFoam changes it up by going for a mid-cut design. Many are appreciative of this design as it feels snug on the feet and gives ample support especially with the addition of a SoftFoam insert. With the black suede adding in character to the kicks, the shoes simply becomes a great piece of fashion accessory to style with. 1924 - Brothers Rudolf and Adolph Dassler team up to come up with Gebrüder Dassler Schuhfabrik (Dassler Brothers Shoe Factory) in their hometown in Germany. 1928 - Dassler spiked shoes take center stage at the Summer Olympic Games in Amsterdam. 1948 - The two brothers get into an argument and part ways. In this same year, Rudolph Dassler decides to start own company named PUMA Schuhfabrik Rudolf Dassler. 1952 - Puma launches the Super Atom, a spiked football sneaker that could be considered to be one of the first black Puma sneakers. 1957 - Taking place are the first elements of the Puma logo, mainly the sans-serif typeface and image logo. 1967 - The cat in the logo is adjusted to take a leap, trademarking Puma and the logo. 1970 -1979 - Puma branches out from football and creates footwear for other activities and sports. 2010 onwards - Puma plays to the demands of the market and its customers, evolving, adding global and influential ambassadors to its roster. What makes Puma such a great contender for black sneakers? The brand has been known to deliver when it comes to quality build and construction. 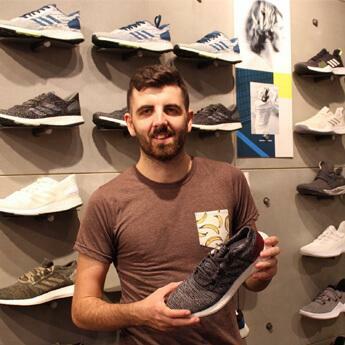 Along with that, the brand’s extensive experience in the footwear industry only further solidifies its reputation. When it comes to quality sneakers, everyone wants the best of the best. What would be the best look to go with for a black Puma sneaker? Definitely casual. These are what the sneakers are really great for. Having said that, the sneakers aren’t limited to just casual wear. Depending on the wearer, black Puma sneakers are heaven sent and go well with almost any look that one has in mind. How does one style and wear black Puma shoes? Casual - Jeans, joggers, shorts, dresses, the choices are endless. For men, it's as simple as going with some nice dark jeans and pairing it with a plain white top and a black bomber jacket. For women who want a stylish flair, black Puma shoes go amazing with short shorts, a tank top casually inserted into the shorts, and a choker for an accessory. Play it up a little by tying a jacket around the waist, and the look is complete! Work - For men, go with a semi-casual look. Think Oxford pants cuffed at the end, and either a button up shirt or polo will do fine. Women can opt for a cute pencil skirt with a cami or tank tucked in, rounded off with a blazer for the office factor. Formal - Wearing sneakers to a formal event hasn’t been unheard of and is, in fact, becoming increasingly popular and widely accepted. But again, not just any sneaker will do. The best to go with are black sneakers (Plus points for it being black Puma sneakers!) and for both men and women, to easily style these, opt or wearing suits that will match the footwear. In which stores can I find black Puma sneakers in? Official Puma stores across the world carry many black Puma sneakers, especially the favorites. Find these stores inside malls, and busy streets that have all the other big brands there, too. Along with that, sneaker retail shops also have these kicks in stock. Can one buy them online? Absolutely! For an even more extensive array of choices, going online and buying online is a great alternative. 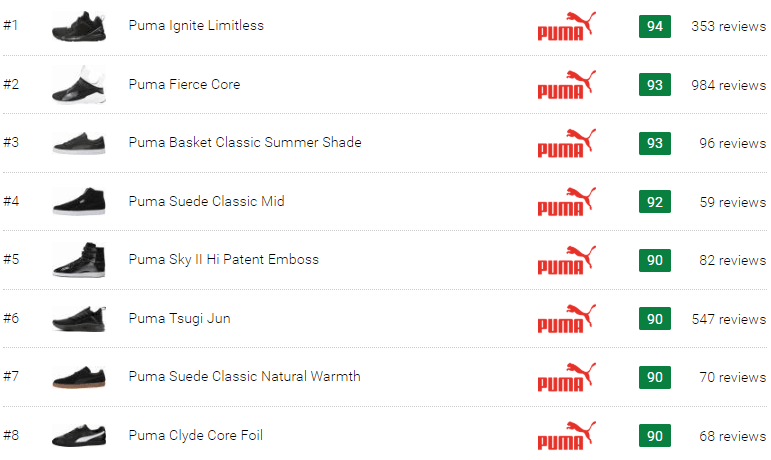 The official Puma website is a great place to start, but other retail sites stock up on black Puma sneakers, too. How do black Puma shoes feel on the feet? It really depends on the material used to construct the specific Puma sneaker in question. Most black sneakers from Puma have been lauded to be comfy, and plush to wear. This is understandable as Puma always uses quality material with its sneakers. How does one keep black sneakers clean? Rid the sneaker of debris with a cloth or brush only. Make sure not to wet the leather. Apply shoe polish to the leather. Get some leather oil to keep the upper’s luster and shine intact. Make a water and laundry detergent solution then use a soft-bristled toothbrush with the solution to clean stains of black Puma sneakers. Air dry the shoes. Do not put them out in the sun directly to dry. Get a fabric protector spray to keep the canvas upper from staining. Remove dirt from the sneaker with a soft-bristled brush. Do not use water to clean the suede sneaker ever. Are black sneakers from Puma more for women or men? There are unisex black Puma shoes, but a lot of these sneakers are also a part of Puma’s women’s collection, perhaps even majority of it. That shouldn’t be a deterrent though as anyone, regardless of gender, can get a pair of men’s or women’s sneakers by directly converting sizes. In the modern world today, crossing over regarding sneakers is widely accepted. What is Puma’s best-selling black sneaker currently? Currently, topping the black Puma sneakers’ list are the black Puma Suede Classics. What should one worry about with black shoes from Puma? What everyone worries about with black sneakers, really. This problem isn’t just related to black Puma shoes, but with most shoe brands: the fading of the black color of the sneaker. This can be quickly remedied by dying the top black though. Make sure that the appropriate dye is used to get the best results. Do prices change depending on what color the sneaker is? Yes and no, depending on the colorway. For those colors that are unique or what the sneaker is really focused on, prices may go up for it. But usually, black Puma sneakers retain the same price as the other colors of the same model.